You've been working at your computer all morning and decide to take a quick break. You plan to spend five minutes reading a news article here, watching a short YouTube video there. But before you know it, you glance at the clock and realize an entire hour has gone by. The internet is full of distractions, and app creators have designed a myriad of tools to help people stay on task, from timers that let you know when it's time to take a break to programs that will block certain sites from your web browser. Eun Kyoung Choe, an assistant professor in the College of Information Sciences and Technology at Penn State, was curious about how effective some of these tools are. So she collaborated with researchers from Microsoft Research and Seoul National University to create a web application called TimeAware, which logs the websites and applications a person uses during the day while calculating a productivity score. The team used the web app in a study to see if the way data was presented to users affected whether or not user productivity improved. "With TimeAware, we could decide whether the data would be shown in a positive way by highlighting productivity, or in a negative way by highlighting unproductive time," said Choe. "I was curious which version might be more helpful in encouraging people to be more productive." Choe has long been interested in "self-monitoring"—when a person collects personal data to learn more about themselves and make positive changes. After using an activity tracker like a FitBit, for example, a person might see they're not walking as much as they'd like and then make an effort to fit in more exercise. But with so many options for gadgets and apps that promise to help improve sleep, encourage exercise and increase productivity, Choe wanted to learn more about what makes them effective or not. 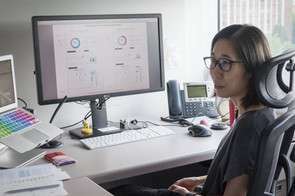 "I like to look at lots of different types of data—such as sleep and exercise data—and create tools for people to collect this information and then make sense of it," said Choe. "The data isn't helpful unless you do something with it." Choe was inspired to create TimeAware after she started using an app called RescueTime, a free program that TimeAware was based on. She found that even though she kept RescueTime running while she was on her computer, the data wasn't as detailed as she'd like and logging in to the website to see her score was cumbersome. "Because the feedback wasn't great, what often happened was I didn't look at my data and I wasn't able to learn anything from it. I wanted to design a system that had better and more helpful feedback," said Choe. "I'm also very interested in this notion of framing—taking the same information and presenting it in different ways, like looking at a glass as half empty or half full. I want to see how looking at data in different ways can influence people." The team used RescueTime's API (or application program interface) to create two versions of TimeAware that were identical except for the way they displayed data: the positive version displayed the percentage of time the user was productive along with a list of their most productive websites and apps. The negative version emphasized the percentage of time the user was unproductive along with their most unproductive sites and apps. In the study, Choe and her team assigned an equal number of participants to the positive and negative versions of TimeAware. Then, they looked at their behavior before, during and after using the app. Choe discovered that only the participants using the negatively focused version increased their productivity, and those using the positive version stayed the same. Choe said that while she had expected there to be a difference between the two user groups, she hadn't foreseen that the positive group wouldn't improve their productivity at all. "I was really surprised that there was no effect on the positive condition, because that's the way most of the apps similar to TimeAware are designed," said Choe. "The study suggests that just looking at and being aware of your current state doesn't really help." Choe also asked the participants about their experiences using TimeAware and found that while those who used the negatively focused version increased their productivity, they were also much more stressed than those who used the positive version. "The negative version was effective but it was stressing people out, which is probably why it worked," said Choe. "In the future, we might look at ways to lower that stress, like only showing feedback at certain times of the day, perhaps at lunch and then before you leave work. Or, having a user be able to set an alarm that would sound when their productivity dips below 70 percent." The team had their research published in a paper in May at the Special Interest Group on Computer-Human Interaction (SIGCHI) Conference on Human Factors in Computing Systems. Even though striving for more productivity is a good thing, Choe said it's also important for people to realize that no one can work 100 percent of the time and that breaks are important to avoid burning out. She said a productivity level of 90 percent within apps like RescueTime is considered very high, and around 80 percent is considered very good. So, no one is perfect. And while Choe hopes to learn more about how apps like RescueTime and TimeAware can be most effective, she said the tools can still be helpful as a starting point for people wanting to be more productive. "Once you get an idea of your productivity levels, then there's the next questions. Are you happy? Are you not happy? Or if you have a specific goal, are you working toward it? What are the ways to achieve that goal?" Choe said. "Those are all follow-up questions that you have to explore. And then reflect on your daily behavior and see where you can make positive changes." So while productivity tools might not help you slay internet distractions once and for all, they might be a good place to start. You'll have to do the rest.